If you ride a motorcycle, you probably know and follow the most basic safety tips. But, if you want to stay safe, you will want to do more than wear a helmet and put on protective gear. Yes, if you are like me and have ridden for a long time, you probably go above and beyond what other amateur riders do. Here are five tips I give new riders who want to stay safe. No distractions: It’s scary enough to ride down the highway as people check their Facebook or chat with their friends on the phone. For this reason, when I ride, I usually only have a radio on, and I don’t blast the volume. But, while in heavy traffic or riding through tough conditions, I usually don’t have the radio on or any other distractions to bother me. This provides me with two benefits. First, when I ride without distractions, I can have more fun and see more of the scenery. More importantly, I don’t worry about accidentally running into someone or drifting into another lane. Watch for people, all the time: Look, a massive SUV is a scary thing, especially when it is five feet to your right. But, as you know, if you are on a motorcycle, everything and everyone is a danger. To combat this, I always scan to the left and right of the road. Kids and adults alike often don’t hear a motorcycle, especially mine as I don’t have a noisy Harley. In my years of riding, I have avoided plenty of accidents by simply scanning the horizon and looking out for kids and other people who may dart out in front of my bike. Look out for road hazards: While on the same subject, you should also scan for other road hazards. While in a car, I can run over a small box or hit a big pothole and not worry. But while on my bike, one small mishap can cause my motorcycle and I to go tumbling onto the road. To do this, you should also look at other drivers and see what they do. When a person in a car swerves, take notice as he or she is most likely avoiding something that you also want to avoid. All-too-often, I have riding buddies who have suffered minor and major injuries when they run over a small item on the road. Be bright: I don’t wear a dorky and large protective vest. But, while on the road, I wear a white helmet and bright colors. This helps me day and night as a lot of drivers, especially older ones, will not see me very well. Since I already have bright clothes in my regular wardrobe, this doesn’t cost me more money as I simply wear those clothes on the right day. Stay fully aware: Finally, if you are smart, you will ride your bike fully aware and awake. This should go without saying, but I never drive with an ounce of alcohol in my system. While a lot of my fellow riders will have a beer or two and stay in the legal limit, I try to take it easy as I don’t want to have a slower reaction time, especially while on a night ride. So, there, you have it. 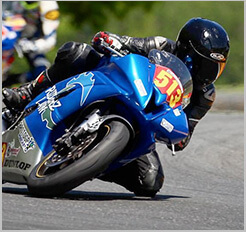 If you are a new or advanced rider, you will want to do more to protect your body and bike. If you don’t, you are likely to end up a statistic.